I have regularly noticed that the first time I try something it works out well, and the second time, disaster. I probably get cocky and think that I know best the second time round, I need to learn that this is seldom the case, perhaps after twenty or fifty goes I can start assuming that I know what I am doing. This certainly applied to the rhubarb crumble cake that I made last week to use up the rhubarb pulp and the whey that came from the yoghurt filtering. The first time I made it, it was great. I lined the bottom of the cake dish with the rhubarb and put a whey-sponge on top followed by a crumble topping. This time, the rhubarb (double the amount called for in the recipe without regard for the other ingredients) went in to the sponge (following a complaint from my husband (Dee) that the rhubarb stuck to the serving plate and was messy) In all there was not enough raising agent, and too much batter in this small dish and the whole thing just collapsed in the oven! 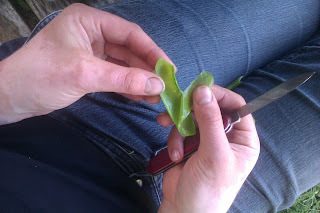 We have been frying it and eating it as a sweetmeat, not the best. I will perfect this recipe, hopefully it won't take twenty or fifty goes to do so, otherwise my waistline will suffer, perhaps not using rhubarb as rhubarb season is coming to an end. I hope to post the perfected recipe in the future. Last week, I figured that it would be wise to add more elderflowers to the cordial, so I steeped loads of heads in half of the cordial, then mixed this up with the other half and bottled it. thus hopefully rescuing the cordial from tasting like lemonade of sorts and firmly settling it in the elderflower category. Elderflowers being medicinal and all. In a pot melt some coconut oil with some muscovado sugar (any sugar is fine), and add honey or syrup to it too. 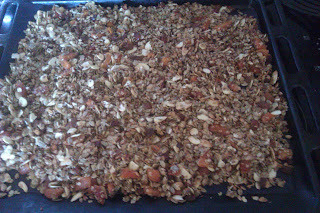 Once melted, pour onto the ingredients in the bowl and mix through till everything is nicely coated, if there is liquid on the bottom, add more oats. Spread out in a thin layer on a baking sheet and bake for 10mins at 60C. 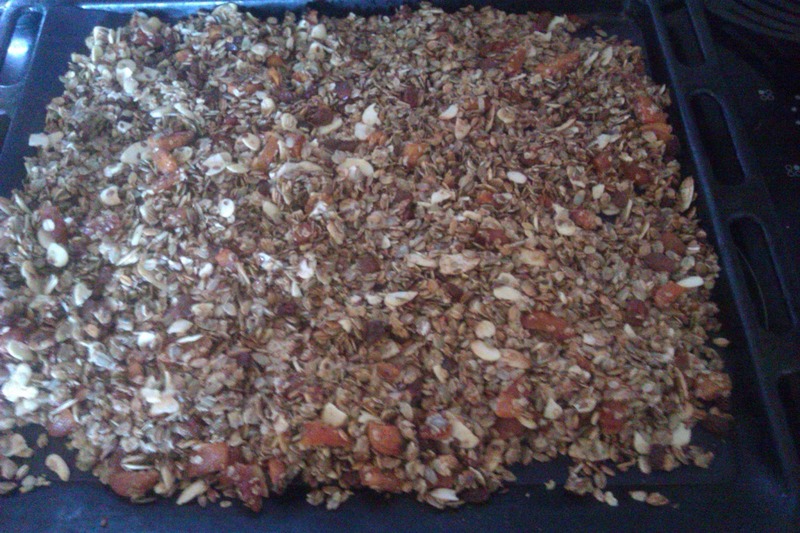 Mix and spread it out again and return to the oven, this time to a cooler over (dehydrator setting). All ovens are different, mine is fairly tempermental, so keep a watch on it so that it does not burn. When it has acquired a brown look to it, it is ready, let it cool down before storing it in an airtight container. Remove peas from pod, slide a knife under the cellulose membrane that lines the pod, loosen this and remove it from the pod, the pod is now perfectly edible (delicious) and none of the pea harvest has gone to waste. Discard the tough membrane. 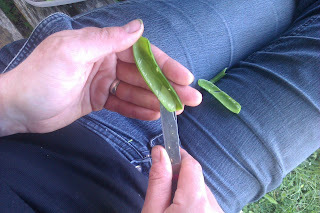 So, into a hottish pan with some olive oil, add your peas and de-membraned pea pods, stir while cooking till they change colour, sprinkle on some salt and black pepper, serve. Bliss! Cheesemaking is something that I thought I would try eventually, but after reading this fantastic website, http://www.cheesemaking.com/ I have decided to jump right in. So from a homebrew supplier I bought a lactic culture, some small cheesemoulds and a bit of liquid rennet. I have also sourced some calcium chloride (useful for the milk we get in Ireland due to the pasturisation process) and I am awaiting the arrival of a digital food thermometer. 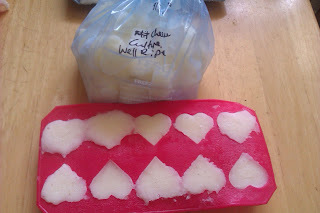 So at the weekend, I mixed the culture with 1L of full fat milk, left it out for around 20 hours, put it in the fridge for a further 12 hours and then froze the cultures into 10ml ice cubes (hearts and penguins) Each of these cubes will culture 1L of milk for souring the cheese before adding the rennet. (I need never buy this culture again!) It is all waiting on the thermometer to arrive and a bit of free time, perhaps Saturday morning, just enough time to get my cheesecloths sorted, and we will get started, so excited! I have yet to decide on which cheese to start with, certainly one of the cheeses suitable for beginners in a kitchen. Well, I have started keeping a journal about what I am feeding my kefir, in this warm weather the kefir is fairly active and possibly containing a small amount of alcohol, not good if you want to drive after drinking it. So, in an attempt to fix it, I am trying it out in 1L batches that run only for 24 hours as opposed to the 48 hours previously, I hope it works, contains no alcohol and is still fizzy but not so fizzy it bubbles out of the bottle upon serving. By the way, don't filter yoghurt on a hot day, it goes a bit sour! I will have to buy another starter (pot of live yoghurt for the next batch. Wow, another great salad...am definitely going to make it!